Discover decadent deliciousness with Delush Natural Sweet Red Wine and tease all of your senses with indulgent moonlight chocolate and creamy butterscotch and caramel flavours. Best enjoyed with real flair, bold expression and a dash of mystery. 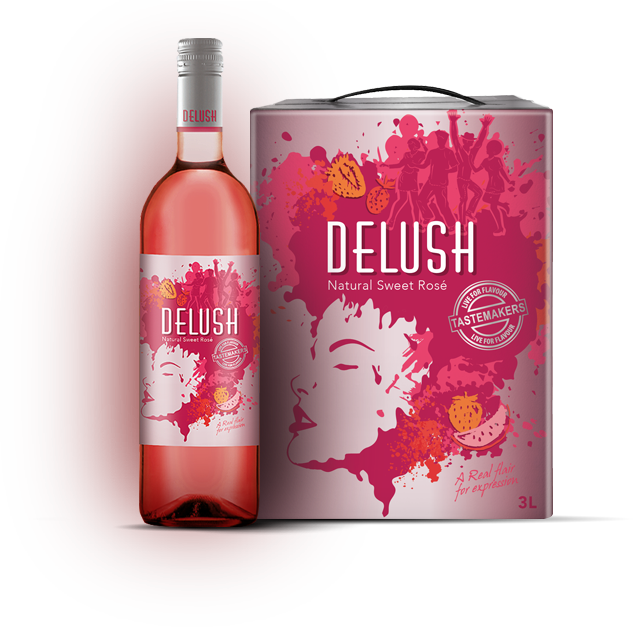 Enjoy double deliciousness with Delush Natural Sweet Rosé Wine and treat all of your senses to cheeky fruitiness and mouthwatering watermelon and strawberry flavours. Best enjoyed with real flair, bold expression and a dash of mystery. Explore delightful deliciousness with Delush Natural Sweet White Wine and surprise all of your senses with sweet sunshine honey and tangy apple flavours. Best enjoyed with real flair, bold expression and a dash of mystery.